The below article contains information and excerpts pulled from Kathryn Kane’s article on the 200th anniversary of Pride and Prejudice from her blog, The Regency Redingote. Wendnesday, Laurie Alice shared about Jane’s long and laborious road to publishing and her subsequent career. Today we look at the publishing of Pride and Prejudice. 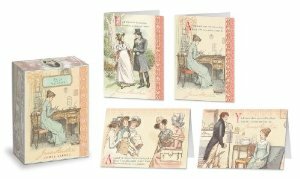 Originally titled First Impressions, the story of Elizabeth, Darcy, and their families and friends was originally written as a collection of letters. This epistolary style of novel was familiar to Jane as she had already written one as a teenager and one of her favorite authors wrote in that style as well. Obviously, she adjusted the format as well as the title prior to publication. 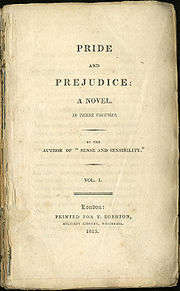 Pride and Prejudice was Austen’s second novel and it was instantly popular. The first print run of 1500 copies sold out even before the first run of Sense and Sensibility, which was half the size. Demand was so high that in October of 1813, her publisher, Thomas Egerton, released a second print run of Pride and Prejudice. A third printing was done shortly after her death. Despite the popularity of the novel, Jane made only £110. Far less than the more than £450 her publisher made. Due to the slow sales of Sense and Sensibility at the time, she sold the rights to Pride and Prejudice for a lump sum. It may very well be the fact that it was ” … light, and bright, and sparkling … ” which made it so popular. In 1813, England was involved in wars on two fronts, for both the Peninsular War and the War of 1812 were ongoing. People were weary of war and the privations which it brought. Pride and Prejudice gave them an amusing respite in the peaceful and traditional English countryside, which many valued highly as the epitome of the English way of life. A countryside and way of life which many realized was already under threat from the relentless progress of the Industrial Revolution. Jane’s fictional village of Meryton was populated by a host of amusing characters involved in the activities of everyday life and her witty tale included a pair of love stories that ended happily ever after. To read more about the writing and publication of Pride and Prejudice, see Kathryn Kane’s original article. Next PostNext Our Favorite P and P People and a Chance to Win!